When the XIX International AIDS Conference drew to a close, #AIDS2012 had been tweeted 85,608 times over the course of the six-day conference – a ten-fold increase over AIDS 2010. With free WiFi available throughout the convention center, the increasing role of new media in health communications, and conference delegates making ample use of smartphones and tablet computers, Twitter took off. The communications team used Twitter to get word out about new resources, such as newsmaker interviews on the YouTube channel and live and recorded webcasts, important news stories, reminders about notable speakers and Global Village activities, logistical or programmatic updates and changes, and conference initiatives such as the Washington, D.C. Declaration and the Turning the Tide Together photo campaign. Because live tweeting of speeches is staff intensive, we limited it this year to the Opening and Closing Sessions and Secretary Clinton’s speech. The live tweeting had steady numbers of retweets and also resulted in many new followers. The widespread use of mobile technology, as demonstrated by the popularity of the conference’s mobile app introduced for AIDS 2012, likely played an important role in the number of #AIDS2012 tweets. 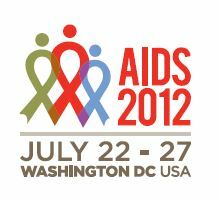 The app, featuring a regularly updated conference programme, interactive venue map, an #AIDS2012 Twitter feed and more, was downloaded 14,475 times. For those who really like numbers, there were 8,158 downloads on iPhones, 4,993 on iPads, and 1,324 on Androids.